Nate Silver kicked up a minor fuss last Friday with yet another NY Times column deriding the Wall Street Journal's Peggy Noonan. There's less than meets the eye to the specifics of this particular dustup, but what's interesting is Silver's ongoing critique of Noonan and what it says about both of them. For today, I'll focus here mainly on Noonan. Noonan's Thursday column on the IRS scandal, relying in part on an earlier column by Kimberley Strassel, used anecdotal examples (those cited by Strassel are fairly hair-raising, as are those in this National Review piece by Jillian Kay Melchior) to suggest that the IRS' admitted practice of targeting Tea Party and other conservative non-profits for audits was symptomatic of a larger dynamic in the use of the IRS (and possibly other regulatory agencies) to target President Obama's identified enemies. Dramatic anecdotes are long a staple of illustrating and humanizing the impact of policy stories and scandals - they're a big part of how political communications work, and sometimes you need to get the smoke in your nostrils to decide where to look for the fire. Silver's response, complete with a superfluous chart, is to note that there's a large enough number of people audited every year that by chance alone, "it’s likely that hundreds of thousands of Mitt Romney voters were selected for an audit in 2012 .... [and] it’s also likely that hundreds of thousands of Mr. Obama’s supporters were audited." Which might be a useful caution against drawing conclusions from small sample sizes, if a few anecdotes was all we had. But this requires that we ignore the facts that (among other things) (1) the IRS has admitted to targeting conservative non-profits; (2) IRS management and senior employees are heavily Democratic and very political, giving some 75% of their campaign donations to Democrats; and (3) the NTEU, the union representing IRS employees, is even more heavily Democratic (94% of donations) and militantly anti-Tea Party. And indeed, some of the examples cited by Strassel or others - when considered in that light, along with the fact that some of these folks were targeted by multiple agencies at once - suggest a broader problem that bears further detailed investigation. Silver concedes of his statistical analysis that "this calculation assumes that individuals’ risk of being audited is independent of their political views," which of course is the very thing in dispute; it's like the old joke about an economist stranded on a desert island with a stack of canned goods whose solution begins, "assume a can opener." All things being equal, all things are equal. [T]he principle is important: a handful of anecdotal data points are not worth very much in a country of more than 300 million people. Ms. Noonan, and many other commentators, made a similar mistake last year in their analysis of the presidential election, when they cited evidence like the number of Mitt Romney yard signs in certain neighborhoods as an indication that he was likely to win, while dismissing polls that collectively surveyed hundreds of thousands of voters in swing states and largely showed Mr. Obama ahead. Now, I would agree that if you're reading Peggy Noonan columns instead of polls in the closing weeks of an intensively-polled national election campaign to figure out who's going to win, you've about lost your mind. My own analyses of the odds at that juncture were based almost entirely on quantifiable data. And I've had my own issues with Noonan in the past - we identified Noonan by name in a 2008 RedState editorial denouncing conservative and Republican commentators who failed to take seriously enough the threat of Obama. More broadly, the commentariat is infested with too many veteran pundits who have been writing on auto-pilot for years and lack subject-matter expertise, real-world experience or the work ethic to dive into the weeds of an issue. But all that said, I think Silver's drumbeat of criticism aimed at Noonan and her type of punditry misses the value such pundits can bring to the table. Noonan's 1990 book What I Saw At The Revolution was a fantastic read, probably the best book written on the Reagan presidency until Steven Hayward's history, but even then, Noonan's was a book about words, feelings, and personalities - about political communication and how it works and reaches voters. She's never been an interesting writer on policy, facts or data - she writes about hopes and fears and how candidates speak to them. She writes from her heart and her gut, not her brain, with empathy rather than logic. Like her less coherent left-wing counterpart and contemporary, Maureen Dowd, Noonan's style is an exaggeratedly feminine approach to punditry (not all female politics writers are like this, by any means - Strassel's not, for example). The reason why Noonan's writing in the past has been interesting, other than simply her talent as a stylist, is that she empathizes with the hopes and fears of a certain brand of voter sharing one or more of her own characteristics - white, female, adult, Catholic but not too Catholic, suburban and/or middle-class in background, not Southern (Noonan's from New Jersey and lives in Manhattan). And, as befits a successful presidential speechwriter, she's often had useful insights into why such voters act the way they do. Polls and other hard data can predict events in the very near future, but all the hard data in the world tracking the behavior of voters is no substitute for understanding why they come to flock behind some candidates, parties, and movements - and those are often the biggest questions confronting political parties and candidates over the long haul or even over the length of a single campaign. Those are the voters who were the center, the core of the old Nixon and Reagan coalitions, and for all his failings (including, conspicuously, getting such voters to turn out in sufficient numbers), Mitt Romney succeeded in winning them over, in keeping together the old coalition. When Noonan wrote that Romney was doing the things he needed to do to win the voters who would decide the election, she wasn't wrong about her intuition: he did win those voters. Obama lost swing-voter group after swing-voter group, majorities of majorities - he lost independents, white women, white Catholics, suburbanites, voters age 30 and up, etc. He lost the center, but he ran up the score so much at the margins that the old center was no longer the center of the 2012 electorate. The 50-yard line had moved. Not every bad idea was originally a bad idea, and not everyone who is wrong today was always wrong. Political communication matters - and pundits who understand it are still useful. The challenge for a pundit in Noonan's position is staving off obsolescence as the center of the electorate shifts (including understanding where and why it will shift in the future). It is entirely possible, for example, that none of the things Noonan thinks of as factors that would lead to a loss of voter confidence in Obama and his Administration - incompetence, pettiness, abuse of power - are things that matter to the people who make up his political base. But writing off the entire project of empathizing with the psychology of voters runs the risk of failing to understand why all present trends in the data will not continue forever. Let me put down here some facts that are worth returning to from time to time, as arguments over the history of Islam and Islamism are back in the news with today's beheading in London. In debates over the history of tension between Muslims and Christians, the Crusades are often cited, out of their historical context, as the original cause of such clashes, as if both sides were peaceably minding their own business before imperialist Westerners decided to go launch a religious war in Muslim lands. This is not what actually happened, and indeed it is ahistorical to treat the fragmented feudal states of the West in the Eleventh Century as capable of any such thing as imperialism or colonialism (although, as Victor Davis Hanson has noted, even in the centuries after the fall of Rome, Western civilization retained a superior logistical ability to project force overseas due to the scientific, economic and military legacies of ancient Greece and Rome). Moreover, when Islam first arose, much of what we think of today as Islamic 'territory' in Anatolia, the Levant and North Africa was Christian until conquered by the heirs of Muhammad, such that speaking of one side's incursions into the other's territory requires you to ignore how that territory was seized in the first place. That entire region had been part of the Roman and later Byzantine empires, and was culturally part of the West until it was conquered by Muslim arms - Rome is closer geographically to Tripoli than to London, Madrid is closer to Casablanca than to Berlin, Athens is closer to Damascus than to Paris. All that said, it's worth remembering that the Crusades arose in the late Eleventh Century only after four centuries of relentless Islamic efforts to conquer Europe, and the Christians of the Crusading era cannot be evaluated without that crucial context. It's somewhat hazy to identify the genesis of the first battle between the Byzantines and Islamic forces, which probably took place around 629 at the Battle of Mu'tah, before Muhammad had even completed the conquest of Mecca; the first sea battle between Muslim and Byzantine forces took place a few years later. The fall of Mecca in 630 solidified Muhammad's control of the western side of the Arabian peninsula, and Muhammad died in 632. A decisive Muslim victory at the Battle of Ajnadayn in 634 spread Muslim control into modern Israel. Between 634 and 689, Muslim forces conquered Christian, Byzantine-held Syria and North Africa. 650-54: Muslim conquest of Cyprus. 652: Muslim Invasion of Sicily begins. 674-78: First Siege of Constantinople, repelled with the invention and deployment of "Greek Fire." 711-18: Muslim Conquest of Spain, which would not be reconquered completely by the Christians until 1492. 717-18: Second Siege of Constantinople. 719: Muslim invasion of France begins, establishing Muslim control of the Septimania region of southwestern France. 732: Battle of Poitiers (Tours); Charles Martel halts Muslim northward march into central France. 736: Muslim Conquest of Georgia, where the Emirate of Tbilisi would hold sway until 1122. 820: Muslim Conquest of Crete, which would be held until 961. 827: Muslim Conquest of Syracuse in Sicily. 846: The Muslim Sack of Rome by troops landing at the port of Ostia, including the sack of St. Peter's Basilica while Pope Sergius II and the helpless Roman garrison retreated behind the city walls. 863: In a rare break from the pattern of this era, the Byzantines go back on offensive, with mixed results over the next 200-300 years of warfare. 902: Muslim Conquest of all Sicily. In 965, an independent Emirate of Sicily would be established lasting until 1091. 1048-1308: The Byzantine-Seljuk Wars, yet another continuation of the mutual, longstanding efforts by the Byzantines and their Islamic neighbors to conquer each other's territory. In 1071, the Battle of Manzikert would prove the first of a series of decisive engagements (followed by the 1176 Battle of Myriokephalon) that gradually wrested Asia Minor from the Byzantines, converting it from a Christian land to a Muslim one and isolating the remaining Byzantine presence to the immediate surroundings of their historic capital of Constantinople. And, of course, Islamic efforts against Europe and the West would continue well after the Crusades, from the Fall of Constantinople in 1453 to the naval incursions finally stopped at Lepanto in 1571 to the epic Seige of Vienna in 1683 (which in turn was followed by another century of bloody wars between the Ottomans and Hapsburgs). As has often been noted, the early history of Muhammad as a military leader and Islam as the driving force of conquest is quite different from the early history of Christianity as the persecuted faith founded by a non-violent martyr, and these differing foundations have presented different challenges for Christian and Muslim thinkers dealing with questions of war, peace, and the defense of self and others. That said, none of this is intended to demonize Muslims as uniquely violent in the Dark Ages. Aggressive wars of conquest were the rule throughout the world in those centuries, and have become only fitfully less so into our own age. But the Crusades did not originate in a vacuum; they were launched in a world where the Roman Empire, the guardian of Western Civilization, had fallen to outside invaders 600 years earlier and European Christians had been on the defensive ever since. The Europe that would stand astride the non-Western world into the middle of the Twentieth Century was still distant in the future. The fearful and divided Christian principalities of 1095 had grown up in a world where Islam, not Christianity, had been the engine of imperial expansion for long before living memory. Virtually nobody in the West and/or what passes for Christendom today argues that violence can or should be justified on the basis of things that happened a thousand years ago. The insistence of Islamist propagandists on revisiting such ancient history for present-day propaganda purposes should be resisted - but it should also be subjected to the corrective of accurate history. And that history is one in which Muslims carried the sword to Europe for centuries before Christian armies took the Crusade to them. Checking off the top act remaining on my current "gotta see live" list, I went with my wife to see The Killers in concert at Madison Square Garden Tuesday night. While there were a few bumps in the road, on the whole the show was a reminder of why they are possibly the best rock band still in their prime today. I've previously described The Killers as "[t]he best young (under-40) rock band, period" - the main competition right now being Grace Potter & the Nocturnals - and their 2006 album Sam's Town is arguably the best album of the last 15 years, so I was eager to get to see them live while they're still at the top of their game, ten years into their career and touring in support of their fourth studio album. Lead singer Brandon Flowers is 31, and the rest of the band is in their mid-30s; Flowers and drummer Ronnie Vannucci released solo projects before their latest album came out, Flowers with a solo album (Flamingo) and Vannucci with his own band, Big Talk (Big Talk). The concert had originally been scheduled for a Friday night in December, but was cancelled when Flowers came down with laryngitis, so our wait for this show had been a long one. MSG is generally regarded as a great arena to see a show - it's not as scenic as Jones Beach, as perfect acoustically as Radio City or as impressive as a stadium show, and it's very loud, but for its size it's a good venue. And, of course, given the proximity to Penn Station it's about the easiest concert venue there is to access by mass transit. I would estimate that the bulk of the crowd was in the mid-20s to early 30s range, which would be people who were in high school or college when the band hit it big almost a decade ago; there were a fair number of people around my age (41) or a little older, but few of the fifty/sixtysomethings you'd see at, say, a Bruce Springsteen concert. There were clearly some college kids but I did not see a whole lot of teenagers, perhaps unsurprisingly given that the band's current album, Battle Born - their only studio album since 2008 - hasn't sold especially well in the U.S. compared to their prior albums or received a ton of radio attention. Every single person I saw at the show was white, a fact that speaks to rock's demographic problem going forward. There was a fair amount of singing along, and the first few rows of general admission in front of the stage were a fist-pumping lot, but otherwise it was your basic crowd of adults on a Tuesday night. A number of people near us bailed out during the last song to head downstairs, presumably to catch trains at Penn Station. On the other hand, this was the first show I've been to in a while where there was really a lot of noticeable pot smoke around us, and on the way out two guys near us started jawing and came to blows. The opening act - originally planned to be Tegan and Sara when the show was first scheduled - ended up being a New York-based band called The Virgins, and their opening set must have been short; the official start time was 8, my wife and I arrived at 8:30 from an event at my son's high school and they'd finished their set already. The Killers went on at 9:10, and played until a little after 11pm. The show opened with an unusual twist compared to most of the concerts I've seen: The Killers just walked onstage without fanfare with the house lights still on and launched right into an energetic rendition of 'Mr. Brightside', their biggest radio hit and still arguably their best-known song. Playing with the house lights on made the Garden feel less like The World's Most Famous Arena and more like an oversized high school gym, all the better to foster a little less distance between the band and the fans. The second song was 'Spaceman', and that was one of two songs on the night - the other being 'Somebody Told Me', much later in the set - that had real audio problems, as there was a lot of rumbling feedback that made it difficult to hear Flowers' vocals. 'Spaceman' has a lot of electronic background production on the album, and I suspect perhaps there was a backing track playing along with the band on those two songs that didn't work all that well. But the sound problems wouldn't be an issue for the rest of the show, as vocals and instruments were both crisply audible. The set also seemed a bit minimalist at first for a band that's always put a lot of thought into its music videos and other visuals, aside from the band's lightning-bolt logo front and center; the one video screen was mounted behind the stage and a bit hard to see from further up. But the laser light show worked well for 'Shadowplay' and the fireworks and confetti as the show reached its conclusion were good visual touches. Flowers talks less between songs than most frontmen; after an early apology for cancelling the original concert date, it was pretty late in the show before there was a break between songs at all, although he did introduce the extremely Springsteenish 'Dustland Fairytale' with a little talk about growing up in Vegas and 'When You Were Young' by talking about being nervous recording a followup to Hot Fuss. There were two other musicians besides the 4-man band onstage, and he completely failed to mention them when introducing the band midway through the show, and ended up re-introducing everybody during the last song. Flowers' quavery, emotional voice isn't really the type that you'd expect to hold up well in concert, but after a bit of a rushed start over the first two songs, he was solid and about 95% of how he sounds in the studio. He's exceptionally skinny - the man has the lower body of a 15 year old - and his stage presence is that of a teenager performing alone in his room with the stereo cranked to 11; rather than try to control his nervous energy, he just channels it into his performance, hopping on and off the risers at the end of the stage and exhorting everybody to clap and sing along with him. He demanded that the fans forget it's Tuesday and put on their dancing shoes for 'From Here On Out', a rockabilly number from the latest album that is fun but not really something you could dance to. Musically, there were not a lot of departures in how the band played their songs, unlike a band like Grace Potter & the Nocturnals that leaves a lot of room in the setlist for extended jams; seeing how sharply executed their songs were and how closely they hewed to the studio versions was a reminder of quite how tightly constructed The Killlers' songs really are. They just seem to have put too much thought into every note of the melodies already to mess with them. Vannucci's drums are the real driving force behind most of their songs, but Dave Keuning's guitar work is just remarkably precise. (Bassist Mark Stoermer has the low-key role, as bassists usually do). Overall, the 20-song setlist was pretty evenly divided and reflected the astonishing depth of quality music for a band with 4 studio albums: 5 songs from their 2004 debut Hot Fuss, 4 from Sam's Town, 3 from 2008's Day & Age, and 5 from Battle Born, plus their cover of Joy Division's 'Shadowplay' from the 2007 Sawdust compilation and 2 covers. They couldn't hit every single one of their good songs ('Bones', for example, really requires a horn section), but they got close; my only real gripe with the setlist was the omission of the best song on Battle Born, the driving uptempo anthem rocker 'The Rising Tide,' while playing the less inspiring title track as a show-closer and the somewhat disappointing 'The Way It Was' as the third song of the show. The more fun of the covers, which the band has been doing this tour, is one of my favorite guilty-pleasure pop hits of the 1980s, 'I Think We're Alone Now', originally by Tommy James and the Shondelles but more famously covered by Tiffany in 1987 - it's a pop song that resonates for my generation (I had just turned 16 when the song hit the airwaves, and it was sung by a 16-year-old singer, and they played it in such heavy rotation on Z100 at the time that you could hear it 3 times in an hourlong school bus ride), but I'm not sure how well-recognized it is by younger rock fans, let alone the Tommy James original (Flowers, with a nod to his own band's pervasive U2 influences, introduced the song by saying, "Tiffany stole this song from Tommy James and the Shondells. Tonight, we're stealing it back."). The other cover was 'New York, New York,' which Flowers delivered well enough in the traditional tempo and arrangement. Which brings up an odd point about The Killers. Some of my favorite musicians - from Bruce Springsteen to the Irish band The Saw Doctors to pop star Kelly Clarkson - give off a strong sense of geographical rootedness, of being from and of a particular place (respectively the Jersey Shore, Galway and Mayo Counties in the West of Ireland, and Texas). The Killers are from Las Vegas, Nevada, and since Flowers discovered Springsteen before recording Sam's Town (named after a Vegas casino) he's made a point of making a lot of references to the band's home town, from the desert motifs of 'Dustland Fairytale' and 'Don't Shoot Me Santa Claus' to 'Battle Born' (named for the Nevada state motto) to his solo track 'Welcome to Fabulous Las Vegas'. In the intro to 'New York, New York' and 'Dustland Fairytale,' Flowers seemed intent on talking up New York (partly, no doubt, in an effort to flatter the local audience) and about how "if you can make it here, you can make it anywhere" is a lot more inspiring than "what happens in Vegas, stays in Vegas." Something in that echoed one of the (fair) criticisms I've seen of Flowers' recent writing: that he may be from Vegas but he's not really of Vegas and doesn't really get the city's gamblers-and-stale-booze culture. He is, after all, a Mormon family man, and his favorite band growing up was the Pet Shop Boys, an influence you can hear in Hot Fuss, an album that sounds more English than American and has no references at all to Vegas or Nevada. As earnest as they are, Flowers' efforts to claim his home town always seem a little forced, forced in the same way as singing 'New York, New York' just because you're in New York. With a touring hiatus and half the band making solo albums before they reuinted for Battle Born, and then the less smashing commercial performance of the album, fans of The Killers can be excused for worrying if their future as a band may be a little uncertain. Battle Born itself might have benefitted if a few of the weaker songs had been replaced by the best songs on Flowers' and Vannucci's solo albums. Even the crowd did not seem all that into the new material beyond the two singles, 'Runaways' and 'Miss Atomic Bomb' (the latter is a ballad, and while it's grown on me, we saw in the ballads on Battle Born why The Killers have rarely recorded ballads). But for now, in concert, they remain at the peak of their game, playing both the old and new material with enthusiasm and skill. It's a very fun show and very much worth seeing if you care about rock & roll. 1-Billy Joel, Worcester Centrum (Storm Front tour December 9, 1989) (no opening act). 2-Tom Petty, Worcester Centrum (Full Moon Fever "Strange Behavior" tour February 7, 1990) (opening act: Lenny Kravitz). 3-Billy Joel, Giants Stadium (Storm Front tour August 1990) (no opening act). 4-Rush, Worcester Centrum (Roll the Bones tour, December 10, 1991) (believe the opening act was Eric Johnson). 5-Meatloaf, Holy Cross College (May 1992) (free concert on campus; no opening act I can recall). 6-U2, Yankee Stadium (Achtung Baby "Zoo TV" tour, August 29, 1992) (opening acts: Primus and the Disposable Heroes of Hiphoprisy). 7-Bruce Springsteen, Boston Garden (Human Touch/Lucky Town tour, December 14, 1992) (no opening act; closed with a duet with Peter Wolf of the J. Geils Band). 8-Billy Joel, Nassau Coliseum (River of Dreams tour - looking back at tour dates this was probably January 6, 1994) (no opening act). 9-Rolling Stones, Giants Stadium (Voodoo Lounge tour, August 1994) (opening act: Counting Crows). 10-Harry Connick Jr., Jones Beach (She tour, summer 1994) (no opening act I can recall). 11-Bruce Springsteen & the E Street Band, Giants Stadium (Reunion tour August 1999) (no opening act). 12-U2, Madison Square Garden (All That You Can't Leave Behind "Elevation" tour, June 17, 2001) (opening act: PJ Harvey). 13-Bruce Springsteen & the E Street Band, Giants Stadium (Rising tour July 2003) (no opening act). 14-Saw Doctors, Irving Plaza, Manhattan (March 14, 2003; reviewed briefly here) (opening act: ex-band member Padraig Stevens). 15-Saw Doctors, Hammerstein Ballroom, Manhattan (March 20, 2004) (no opening act I can recall). 16-Kelly Clarkson, Hammerstein Ballroom (October 6, 2009) (opening acts: Parachute and Eric Hutchinson; reviewed here). 17-Saw Doctors, Irving Plaza (May 14, 2010) (opening act: former Smithereens frontman Pat Dinizio; reviewed here). 18-Maroon 5, Jones Beach (August 11, 2010) (opening acts: VV Brown and Owl City; reviewed here). 19-Grace Potter & The Nocturnals, Irving Plaza (March 10, 2011) (opening act, which I missed: Belle Brigade; reviewed here). 20-Kelly Clarkson, Radio City Music Hall, January 21, 2012 (opening act: Matt Nathanson; reviewed here). -John Cafferty & the Beaver Brown Band, Holy Cross College, spring 1993 (I also saw the part of a show by the Mighty Mighty Bosstones at HC, who later went on to become a slightly well-known national act). -Bruce Springsteen & the E Street Band, the Today Show at Rockefeller Center, September 28, 2007 (reviewed here). -Kelly Clarkson, the Today Show at Rockefeller Center, October 25, 2011. Polls are back in the news, with the release of four public polls and an internal Gabriel Gomez campaign poll in the June 25 Massachusetts special Senate election to replace John Kerry. 3 of the 4 public polls show Ed Markey with a distinct but still surmountable lead, an average of 6 points; the fourth shows him up by 17 and looks like an outlier, adding 2.7 points by itself to Markey's lead in the RCP average. The Gomez campaign's internal poll shows Markey by 3; if you use the general rule of thumb that a campaign conducts multiple internal polls and will only release its most favorable internal, that's consistent with this currently being a 5-7 point race. Which is not a bad place for a Republican to be in Massachusetts five weeks before the election - it gives Gomez a puncher's chance in a special election - although you'd clearly still put better than 50/50 odds on Markey. The closest public poll so far was put out by progressive Democratic pollsters PPP; its first poll of the race has Markey up by 4, 44-40. Let's take a look at how PPP polled the last Senate race in Massachusetts, the 2012 race between Scott Brown and Elizabeth Warren, which Warren ultimately won 54-46. 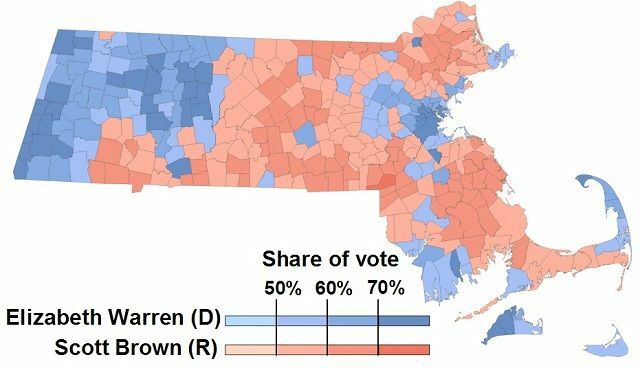 That race may be less predictive of this one than the 2010 special election between Brown and Martha Coakley (in which PPP was one of the more reliable pollsters), but it's interesting as an exercise in examining how PPP samples the electorate. PPP is one of two national pollsters - the other being Rasmussen - to publish regular statewide polls across the country, and that frequency in and of itself has made both pollsters into major players in public polling. At the moment, PPP is riding high, having posted a better record in 2012 than Rasmussen, while Rasmussen (who did some polling for Republicans in the past and retains a presence in conservative media) had built its reputation in better years for the GOP like 2002 and 2004. There's a chicken-and-egg question in there, as to whether pollsters with something of a partisan tilt are just getting lucky in years when the electorate favors their side; as I noted in my November post-mortem, the stricter likely-voter screens of pollsters like Rasmussen worked better in the turnout environments of 2002 and 2004, while PPP's looser screen better approximated turnout in 2012. PPP's polling single-handedly drove the coverage suggesting that Burr was vulnerable, it was out of step with the other pollsters, and it was flat-out wrong. PPP was hardly the first or last pollster to blow a race, of course; the point here is to identify an example of a race where Rasmussen's approach was clearly a lot more reliable guide to what was happening than PPP's. All pollsters require careful scrutiny if we are to use their work product as tools for advancing rather than obscuring our knowledge of elections, and the halo effect surrounding PPP after the 2012 election should not exempt it from that scrutiny. Jensen conceded that the secret to PPP's success was what boiled down to a well informed but still not entirely empirical hunch. "We just projected that African-American, Hispanic, and young voter turnout would be as high in 2012 as it was in 2008, and we weighted our polls accordingly," he explained. "When you look at polls that succeeded and those that failed that was the difference." Given the methodological challenges currently confronting pollsters, those hunches are only going to prove more important. "The art part of polling, as opposed to the science part," Jensen said, "is becoming a bigger and bigger part of the equation in having accurate polls." As you can see, PPP dramatically shifted gears based on something starting in its October 14 poll, and that enabled it to get closer to the final result as reported by exit polling. The vagueness of Jensen's public explanations of his methodology suggest a man who is not really sharing his secret sauce. My guess - which I stress here is pure speculation in the absence of evidence, so I'm happy to be corrected by Jensen - is that PPP may have been doing non-public work for OFA or some other Democratic or liberal-interest-group client, and gathered information (maybe about OFA's superior turnout operation, maybe about non-public polls) that was not generally available, and modeled its polling assumptions around that. (There's nothing illegal or necessarily unethical about doing so, but if that's the case, it would suggest that public polling is more driven by non-public information than you might think). If that's how Jensen formed his assessments of the electorate, then we can assume that PPP's turnout-projection models will continue to be superior so long as Jensen has access to better-informed sources of non-public information than other pollsters (it's clear that in 2012, Democratic campaigns knew things about turnout that Republican campaigns didn't, and Republican campaigns did not know any things about turnout that Democratic campaigns didn't; one hopes this will not always be the case, as it plainly was not in 2004). On the other hand, if we take Jensen at face value and assume he really is just guessing, then his guesses are as variable as those of any other reasonably well-informed pundit. The 2012 Massachusetts Senate race is just one of many case studies from which we can look at how PPP's shifting assumptions about turnout interacted with its polling. 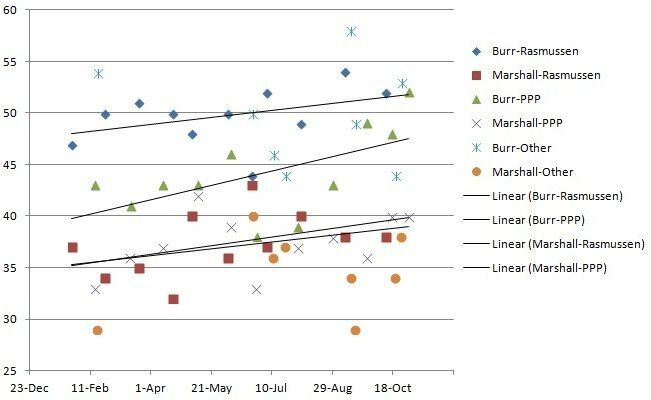 PPP showed Brown with a 5-point lead in August, at a time when Brown held about a 1-point lead overall in the RCP average - but according to PPP, the race shifted 7 points in Warren's direction in September, 4 more points in October, and 2 more into November. PPP's final result actually understated Warren's margin of victory by 2 points. What changed? In each case, I will compare PPP's internals to the exit polls. The exit polls - assuming those are accurate, which is never really certain - suggest that PPP went overboard in projecting that the Massachusetts electorate would be 55-57% female in 2012, and the final poll understated the gender gap, which ended up closer to what PPP's October poll had estimated. That said, clearly the shift to more female voters in the sample had a measurable impact on Warren's support. For what it's worth, the current poll showing Markey up 4 also has a 55% female sample, although the gender gap is less pronounced (Markey leads 46-36 with women, Gomez leads 45-41 with men). As it did in Florida, PPP started upping the non-white share of its sample in Massachusetts near the end of the race. But this time, it overshot the mark: the exit polls showed an electorate that was 14% non-white, lower than the 16-18% in PPP's polls from September-November. A share of the vote that small is bound to be "noisier" - that is, there's a small-sample-size problem where it's harder to get enough non-white voters to poll them reliably if they're less than 20% of the people in your overall sample. While the trend in PPP's poll was a dramatic dropoff in Brown's non-white support, the actual numbers are just nuts: there's no way Brown went from leading among non-white voters with 47% of the vote in August to down 35 points in November to losing by 72 on Election Day. It's possible that there's some instability here among whether Hispanic voters were reporting themselves as white, but that result just doesn't make any sense at all. Among white voters, PPP's final poll showed Brown pulling ahead for the first time since August, even as his overall standing was at its low ebb; the exit poll showed him winning white voters 51-49 but losing the race due to his poor standing with the remaining 14% of the electorate. PPP's Gomez-Markey poll has an 84% white electorate with Gomez down 2 points among white voters (41-43), underperforming Brown but with a lot of undecideds, and 13 among non-white voters (36-47), a showing with non-white voters that's consistent with Brown's August-September polling but wildly inconsistent with the exit polls. The number of 18-29 year olds answering the September 13-16 poll dropped in half from August and didn't recover until November - that could be the result of any number of anomalies, but I have to assume that it had something to do with it being the start of the college calendar (Massachusetts has an enormous proportion of college students). But even so, not one of PPP's polls matched the 19% under-30 turnout of the exit polls (bear in mind here, however, that younger voters may be more likely to answer exit polls). The youth-voter sample is, again, noisy - Warren was bleeding Brown's support among young voters into October, but PPP's final poll had Brown winning 50% of the under-30 vote; the exit polls had him lose it by 12 points. (Note one other minor methodological discrepancy: PPP's use of an age 30-45 bracket, whereas the exit polls used a 30-44 bracket). The Gomez-Markey poll had just 9% voters under 30, which may not be a bad estimate for a special election after the end of the college year, with Gomez down 40-33 among young voters. The October PPP poll oversampled Democrats and the August poll with Brown up 5 actually undersampled Republicans, but otherwise PPP's polls were fairly consistent in their partisan sampling for this race. But what PPP was reporting was a steady consolidation of Democrats behind Warren as she made the race more ideological and put the primary behind her. On the other hand, every PPP poll, especially the final one, understated Brown's support among his own party. (By contrast, the self-reporting of voter ideology was about the one element that was very consistent month to month in PPP's polling, but I've never really put much stock in self-reported voter ID). The Gomez-Markey poll had a D-heavy sample at the expense of independents, 41/17/42 D/R/I, with Gomez up 47-31 among independents, Gomez drawing 21% of Democrats and Markey drawing 17% of Republicans - all signs of a race the voters haven't really focused on yet. The new conventional wisdom on polling is that the key to accurately forecasting elections is getting the demographics right: if you predict who will vote, by race, gender, and age, you can pretty accurately profile who they will vote for. Yet despite PPP's status as one of the icons of this brave new era of polling, its record in the 2012 Brown-Warren race - a race in which its topline results ended up on the mark - suggests that it was actually better at modeling the electorate by party ID and ideology than by race, gender or age, that its assumptions about the demographics of the electorate changed a good deal from month to month, and that within each demographic group its reported results were often highly unstable. Given the difficulty of accurately projecting turnout in special elections, even the polling averages have to be taken with some grain of salt in the best of times, but polling in the age of Obama is ever more art than science. David Wright is back, or rather he's still back. Wright, who batted .311/.394/.534 (OPS+ 141) from 2005-08 (age 22-25), slumped to .284/.364/.463 (OPS+ 124) from 2009-11, the first three years in the new Citi Field in what should have been his prime hitting age, 26-28. But over the 2012-13 seasons so far, he's hitting .307/.396/.497 (OPS+ 146), reclaiming his status as an elite player. A major factor in both turnarounds has been Wright's strikeout rate. From 2005-08, Wright averaged walks in 11.8% of his plate appearances, strikeouts in 16.6%. From 2009-11, the walk rate slumped slightly to 11.2%, but the K rate ballooned to 22.9%. Strikeouts are not much worse than any other out, but when a player suddenly starts striking out a lot more, that's usually a bad sign. Since the start of 2012, however, Wright is back to a BB/K rate of 12.8% walks, 16.5% strikeouts. When you break it out by month, it's hard to avoid the conclusion that Wright was particularly badly affected by his August 15, 2009 beaning, which caused him to miss the rest of that month; while his K rate was already up in April-May 2009 (14.6% BB, 24.9% K, mostly due to adjusting to an unfriendly new home park - 11.2% BB, 31.2% K in home games those two months, 18.3% BB, 18.3% K in road games), he'd been whittling it down the rest of that season (12.0% BB, 18.3% K in June-August 2009), before being beaned by Matt Cain. 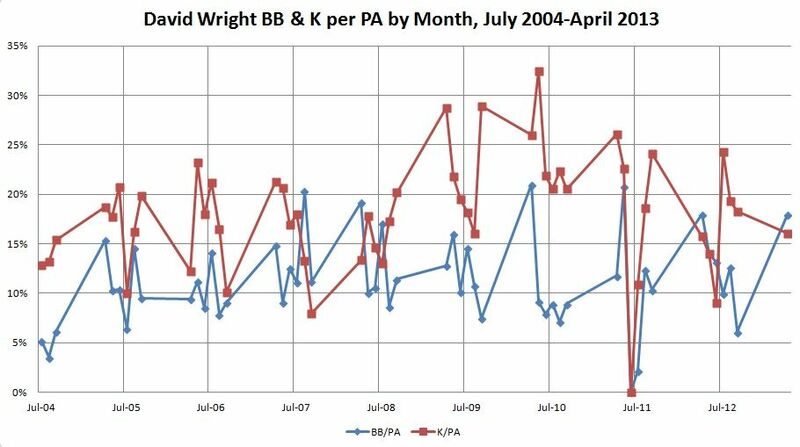 From his return in September 2009 through May 2010, Wright averaged an unsightly 8.7% BB and 25.1% K rate. It took a while to gradually get that back to a more normal (for him) ratio. I put the month-by-month graph below the fold because it's very wide.